PGD ONE™ is a test that detects the genetic defects (mutations) inherited by a child from their parents. DNA material from embryos is analysed prior to transfer to the uterus, that is, before the woman actually becomes pregnant. The test can be carried out on material collected by biopsy in the 3rd (blastomere) or 5th/6th (trophectoderm cells) day of the embryo culture. Because of the risk of misdiagnosis caused by the pollution of sperm when using standard in vitro fertilization, the ICSI procedure is recommended. Any diagnosis of PGD ONE™ is treated individually and preceded by an examination of the material from the prospective parents. Under the procedure, a frozen embryos transfer (FET) is required. PGD ONE™ is a preimplantation genetic diagnosis for monogenic diseases. Why is it worth to perform PGD ONE™? 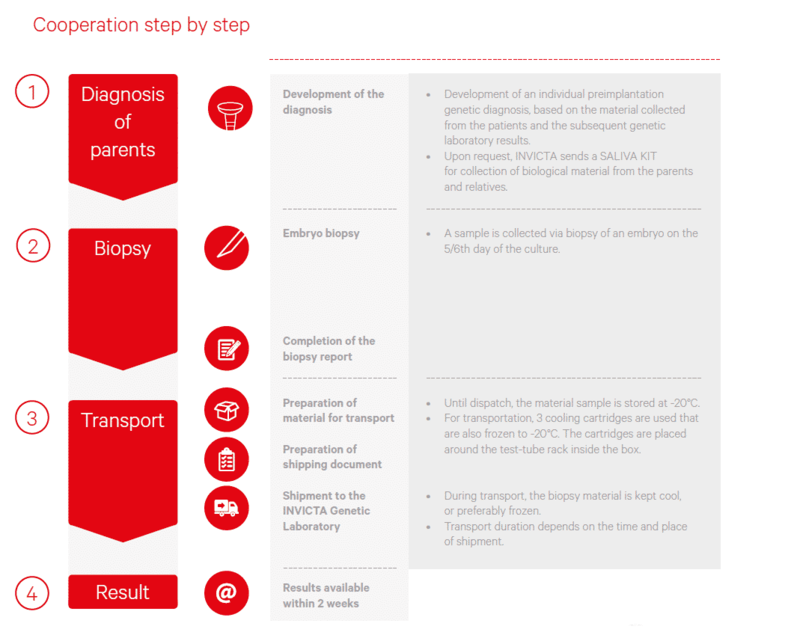 The world’s first use of NGS (Next Generation Sequencing) in the PGD ONE™ preimplantation diagnosis for monogenic diseases. Table 1. 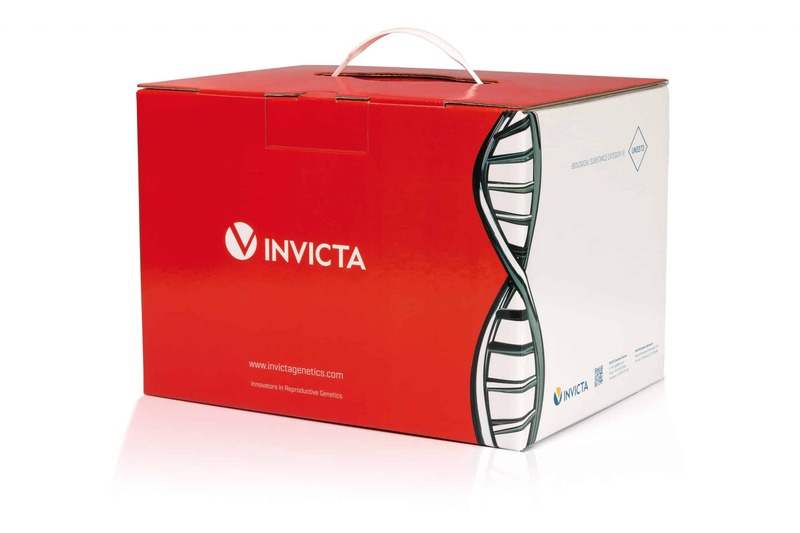 Twenty of the most routinely sought point mutations in a PGD ONE™ preimplantation diagnosis at the INVICTA Genetic Laboratory. What are the indications for PGD ONE™? PGD ONE™ is individually designed preimplantation genetic diagnosis for particular patients in order to exclude transmission to descendant a genetic feature proven to be a cause of disease by test results from genetic diagnostics laboratory. Performing PGD ONE™ does not exclude risk of genetic disease, which may be resulted from other factors, e.g. de novo mutations, undiagnosed mutations, or other genetic diseases. 4. Corrales I, Catarino S, Ayats J, Arteta D, Altisent C, Parra R, et al. High-throughput molecular diagnosis of von Willebrand disease by next generation sequencing methods. Haematologica 2012;97:1003. 5. Rechitsky S, Pakhalchuk T, San Ramos G, Goodman A, Zlatopolsky Z, Kuliev A.First systematic experience of preimplantation genetic diagnosis for single-gene disorders, and/or preimplantation human leukocyte antigen typing, combined with 24-chromosome aneuploidy testing. Fertil Steril. 2015 Feb;103(2):503-12. doi: 10.1016/j.fertnstert.2014.11.007. Epub 2014 Dec 13. 10. Field PD, Martin NJ. CFTR mutation screening in an assisted reproductive clinic. Aust N Z J Obstet Gynaecol. 2011 Dec;51(6):536-9. doi: 10.1111/j.1479- 828X.2011.01348.x. Epub 2011 Aug 22. PGD ONE™. Preimplantation Diagnosis for monogenic diseases.